Michael Arnone + Associates designs beautiful, sustainable landscapes tailored specifically to your site and project goals. We believe that good design should not be contingent upon project size or budget. We offer a range of design services for the individual landowner, from hourly consultations to full scale Master Planning and Construction Documents. We are happy to meet clients on-site for a free initial consultation, to talk about project goals and design services. We are committed to providing high-quality, punctual, cost-effective design services. In addition to good design, we believe a successful project is based on cultivating strong client relationships and providing sustained attention to detail. We regularly team up with architects, engineers and environmental consultants to provide integrated, complete design solutions. Parks, playgrounds, streetscapes and municipal centers are community assets designed and built for all to enjoy. Contributing to the growth and development of our communities is our passion. We work closely with city and county agencies along with public committees to achieve a consensus of opinion; understanding the needs of each group in order to make our final design successful for all. This entry garden overlooking the Monterey Bay creates a whimsical space for entertaining and a fun-filled play scape for children. Replacing an old deck and a large, non-functioning pond, the new turf area, flagstone patio and walkway provide a safe and inviting approach to the beach cottage. The seat wall patio and natural fire pit are oriented to focus guests on the panoramic views of Manresa Beach. The new ship’s deck and captain’s wheel wrap around the ocean side of the house create a unique play area for guests of all ages. An outdoor shower is conveniently hidden along a walkway coming up from the beach. The stone and colored concrete were selected to compliment the stone of the house. This award winning* contemporary outdoor entertaining space was designed for a family with young children. The new design reduces the amount of lawn but still provides play space for kids and an area to cook and relax. A retaining wall creates terraced rooms from the previously sloping, under-utilized lawn. The top terrace connects directly to the house and provides space for a grill, and outdoor dining area. A fountain and sandbox centered on the living room doors allow for a direct line of sight to children playing outside. As the children grow, the sandbox can be retrofitted as an outdoor fire-pit. Materials including Ipe wood decking and poured concrete walls were selected for durability and a clean modern aesthetic. The lower terrace provides a lawn, outdoor shower and drought tolerant colorful planting beds that also provide privacy from an adjacent park. *2014 CLCA 1st place Small Residential Installation by Prime Landscape. This west side backyard was mostly lawn when the owners commissioned our design team to rethink the space. The renovated garden utilizes all water conserving plants providing both privacy and year round interest. A new bioswale along the perimeter of the property catches surface water and allows it to percolate into the soil. Amenities include a raised vegetable bed made with natural stacked stone, an arbor covered seating area, a gas fire element, a recirculating natural stone water feature and a cooking island. Curved flagstone pathways and planted berms traverse the back yard leading to a bench and secluded spa. The resulting transformation is featured in the Santa Cruz Municipal Water District’s list of water conserving/lawn free design examples. Built in 1926, the Windmill House and Silo House are landmarks along Soquel Creek in beautiful Capitola-by-the-Sea. The renovation of the landscape whimsically mirrors the eccentric nature of the original builder/owner. Tumbled flagstone used to simulate water washed stone from the river creates a walkway from the used brick patio to the new wooden deck overlooking the creek. Colorful plantings, window boxes and containers also reflect the playful theme of this river retreat. Other amenities include a spa, outdoor shower, a putting green, and a raised seat wall planter and fire pit. To fulfill the owner's wish list on a small and sloping site presented some design challenges to our team. The final result incorporates terraces to maximize every square foot of the back yard to include a circular fire pit, in-ground spa and natural shape swimming pool. Both the spa and the lower wall have waterfalls that spill into the pool, using the terraces to create a design feature. The bar and cooking island are covered with a shade structure for comfort from the late afternoon sun. The pool equipment is hidden behind the bar area with access to the service driveway and media room. A tropical planting theme was used to compliment the resort feel, with privacy created using decorative fencing and large mature perimeter plants. Water is a central theme in this garden, starting with a "walk over water" entry courtyard. The wooded backyard is the setting for a large, curved deck and natural creek bed with three waterfalls. The water feature is the focal point of the view from the kitchen, living and dining room windows. The owners built this wonderful ocean side home on property owned by their family for two generations. The terraced design provides space for dining, sitting around the fire and taking in the breathtaking views of the Monterey Bay. Plants are all drought resistant and adapted to the direct sea coast exposure. Walls and railings were designed to fit the beautiful architecture of the home. This garden, located in the hills of Saratoga, was designed to emphasize the beautiful oak woodland and panoramic valley views. The terraces provides a sequence of garden rooms to accommodate varying group sizes and uses. The main cut stone patio and outdoor kitchen offer a space to entertain, cook and enjoy the surroundings. The outdoor kitchen is anchored by a stone fireplace and pizza oven linked with a curved, black granite-covered counter. On either side of the fireplace and pizza oven are counters for food prep and cooking that include a grill, sink, refrigerator, wine cooler and kegerator. Removed from the main patio, a sunken patio with a fire table provides an intimate gathering space. The design for the landscape areas at the Whole Foods Market in Capitola focused on planting that would complement the vibrancy and strong architecture of the renovated storefront. In keeping with Whole Food's environmentally conscious values, green building materials such as pervious concrete and reclaimed wood for the outdoor planters were used in the landscape. A drought tolerant plant palette was used throughout the project. Within this palette, plants were selected for color, texture and hardiness to the urban environment. Special attention was paid to "greening" the outdoor eating areas to provide natural, living elements to create synergy with the built elements. The urban lifestyle is enhanced in this newly completed development just a few blocks from the headquarters of Google. The design provides common areas for residents to mingle and enjoy a fire pit, seat walls and benches. Bio-retention areas capture all of the water runoff from the building and paving. A tree lined paseo between the townhomes creates separation and privacy. Deciduous trees have been placed along the south and west side of the development to provide summer cooling while allowing the winter sun to warm the homes. All plants are water conserving and are watered with a drip irrigation system. The simple and modern planting design for this popular local market responds to the contemporary architectural style of the building. Plant selection was dictated by hardiness to the urban environment and drought tolerance. Plants with bronze foliage were selected to tie in with the outdoor metal fireplace and the building accent colors. Some edible plants and herbs were included as a nod to the context of the building. 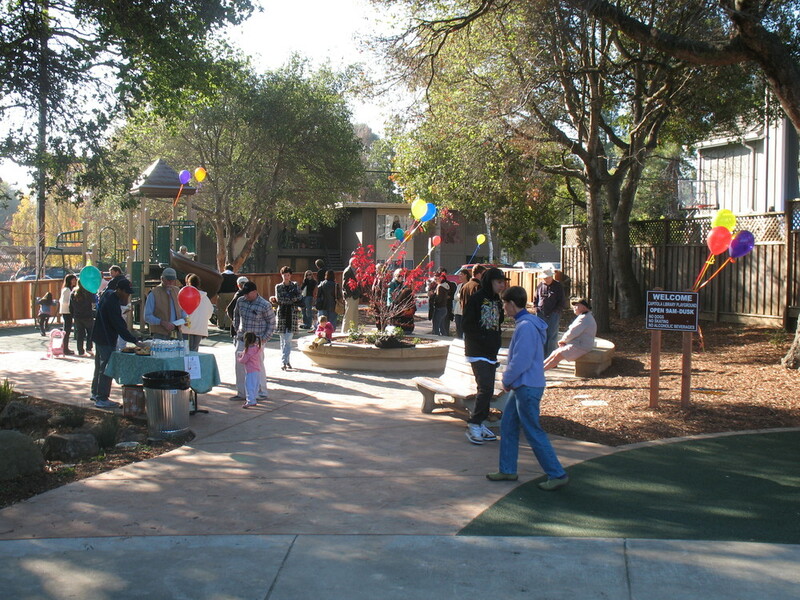 The incorporation of a park next to the existing Library in Capitola has provided the community with a safe, beautiful place for outdoor reading, socializing and playing. The stately Oak trees native to the site give the park a calming dappled shade and are the backdrop for the seating and play elements. Parents are often seen enjoying lunch or a book on the seatwall under the oak canopy, while children are actively playing on the selected play structures or imagineering with stones, leaves and sticks in the dry creek bed. This project focuses on a water wise plant palette and bioswales with native rushes and reeds to hold and purify collected rainwater. Surface water and rain water from the building's roof are directed to the bioswales, diverting it from the storm drain system and allowing it to percolate into the soil. Drought tolerant natives and Mediterranean plants create a seasonal display of color. Colorful animal murals along the side of the building add artistic elements and help people find the building along the 7th Avenue corridor. 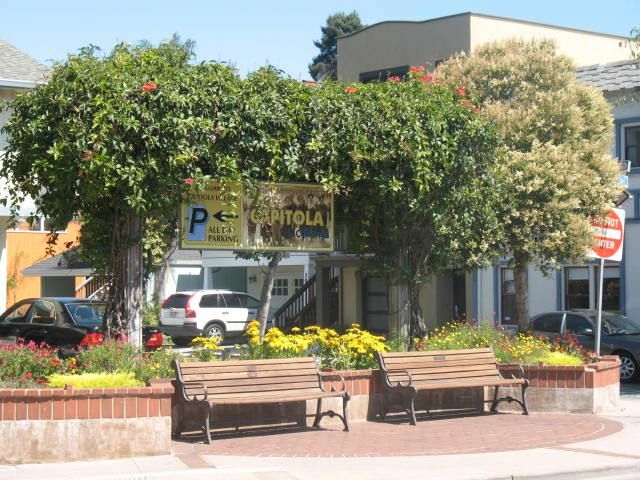 The Capitola Village known for it's beach, shopping and restaurants is a popular destination for tourists and locals throughout the year. Improvements to the streetscape focused on pedestrian scale elements that would enhance the quaint, seacoast village atmosphere. Sidewalks were widened, bike lanes, vintage street lights, benches and street trees were added along with special paving for crosswalks to create a safer, more pedestrian friendly village experience. Parking was provided along the perimeter of the village to encourage walking. Three new public seating areas defined by raised planters were created. New at-grade planters, containers and hanging baskets provide colorful plantings throughout the seasons. Renovations included colored concrete walkways, antique street light fixtures, benches and engraved bricks.